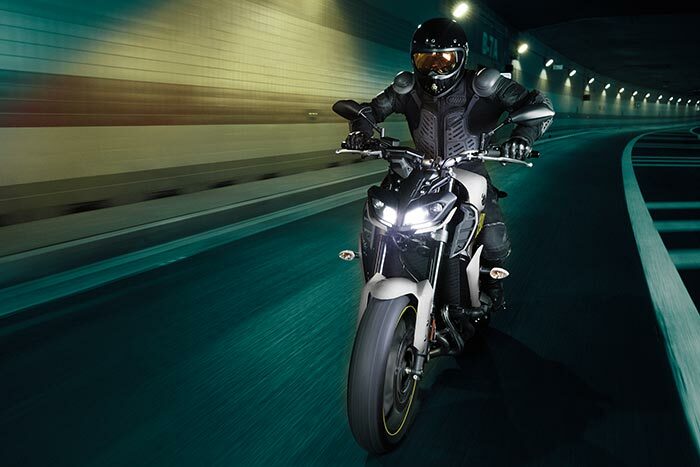 The new FZ®-09’s powerful 847cc in-line 3-cylinder crossplane crankshaft concept engine and new refinements deliver huge thrills, style and class-leading performance. The FZ-09 naked sports roadster has taken the next step in its evolution. Heading an impressive list of changes for 2017 is the addition of confidence inspiring ABS brakes, all- new super aggressive “twin eye” LED headlights and a revised fully adjustable 41 mm inverted fork thanks to the addition of compression damping adjustment. The one thing that didn’t change is the incredible 847 cc, 3 cylinder engine that is guaranteed to put a grin on your face every time you twist the throttle. New, ABS equipped brakes feature dual 298 mm discs with 4-piston calipers up front and a 245 mm disc with single piston caliper in the rear providing piece of mind while braking under pressure or in wet conditions. 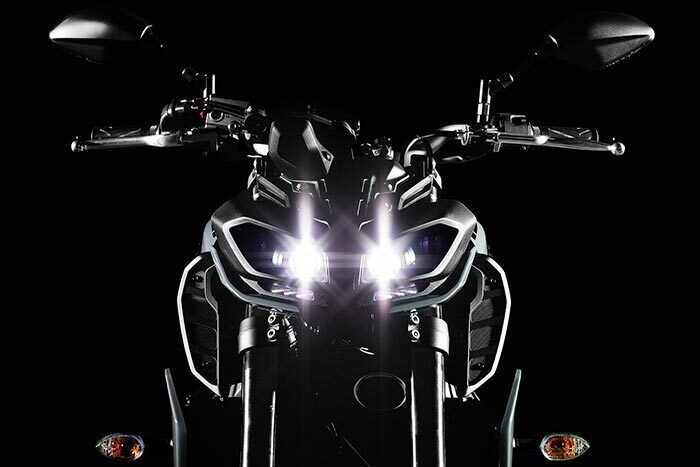 The FZ-09 features an aggressively styled twin-eye headlight assembly that gives this best-selling naked sport a more menacing look. The slanting dual headlights are equipped with four LED bulbs, accompanied by dual LED positioning lights. 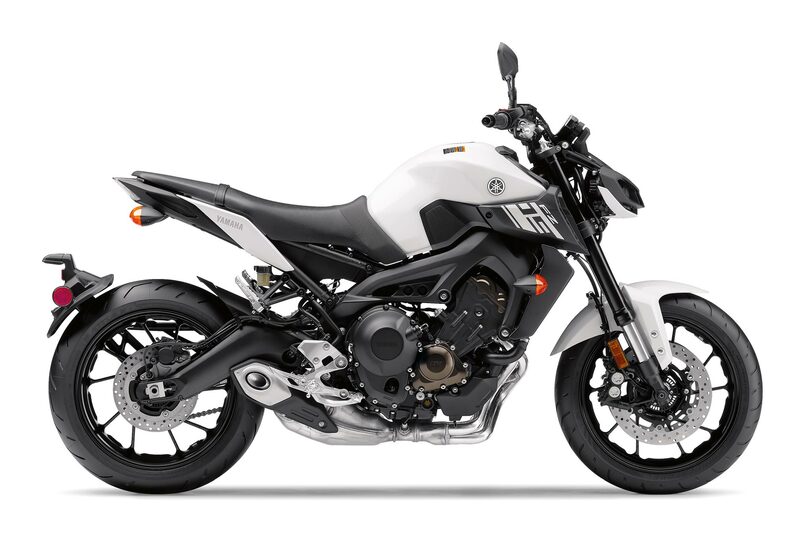 Note: FZ-09 is the MT-09 in Europe. Packing aggressive style and impressive performance, the original FZ-09 blew open the naked sportbike segment. Now it’s back and more refined than ever, featuring adjustable traction control, a fully-adjustable fork, ABS, and an aggressive look unlike anything else on the road. 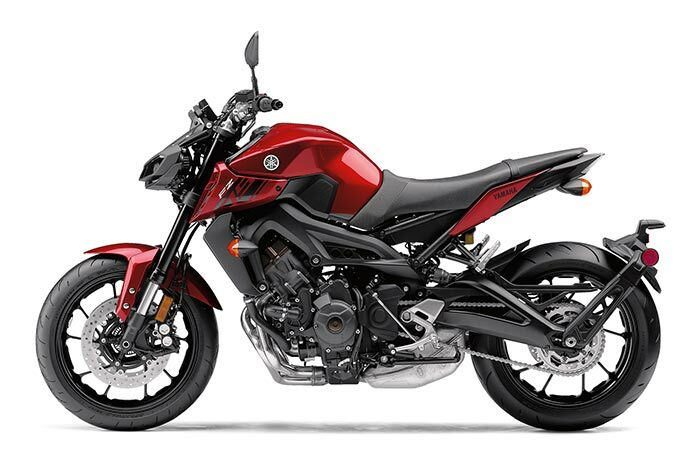 The FZ-09’s 847cc CP3® engine combines advanced electronic systems—including YCC-T®, Yamaha D-Mode and multi-mode traction control—with a crossplane concept crankshaft to deliver an exciting, torquey and quick-revving engine character built around rider-centric control. Thanks to the compact motor and narrow frame design, the FZ-09 weighs in at only 425 pounds. Combined with optimized chassis dimensions and rider ergonomics, the FZ-09 achieves a sporty, light and neutral handling character, with an upright riding position suitable for just about anything. With a new fully-adjustable fork, the FZ-09 is now even more adaptable, with improved front-end control across a wide range of road conditions and riding styles. •Slim, compact, 847cc, DOHC, 4- valve, liquid-cooled, 42.5 degree inclined, inline-three cylinder engine. The engine has been tuned to provide plenty of low & mid-range torque with strong yet linear throttle response. • Valve adjustment intervals are every 42,000 kms. • Lightweight “coupling force balancer” is used to reduce engine vibration for excellent rider comfort. •”Fracture split” connecting rods feature a “nut less” design. •design aids in establishing true big end roundness & greater precision in con rod dimensions for excellent durability despite the high horsepower loads. •Lightweight, forged, aluminum short skirt pistons. •Direct ceramic composite plated cylinder uses “liner less” bores. •One-piece cylinder and upper crankcase assembly. •Crankcases feature a “Tri-Axis” layout for the crank, main & drive axles. • Closed loop Mikuni, 41mm, throttle body fuel injection system. • Yamaha Chip Control Throttle (YCC-T). • Yamaha D-Mode variable throttle control … 3 modes available. • Traction control system with 2 modes plus off. • Electronic Control Unit (ECU) utilizes a powerful 32-bit processor for fast control of the injection, engine management & ignition processes. • Air box features dual resonator chambers & unequal internal intake funnel lengths for all 3 cylinders. • Compact, slipper (back limiter) clutch with assist. • Revised, compact, low mounted, 3 into 1 exhaust system. • Flat design radiator with new side scoops. • Wet sump lubrication system with liquid-cooled oil cooler & easy access drain plug & oil filter. • Air Injection System (AIS… not ram air) injects fresh air into exhaust ports to fully burn any unburnt fuel, reducing exhaust emissions. 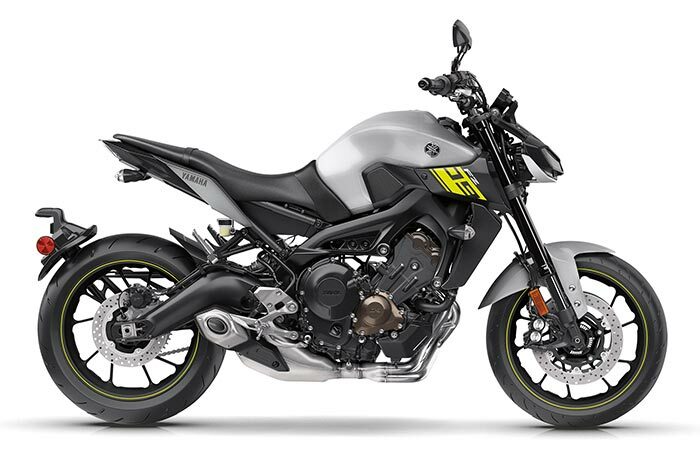 • Riding position is one of the most important features of the FZ-09 chassis. • Detachable, round tube steel rear sub frame. • Externally mounted, C.F. (Controlled Filling) die cast aluminum, truss-type rear swingarm. • Revised, fully adjustable, 41mm inverted fork offers 137mm (5.4″) of wheel travel. • Lightweight, aluminum upper & lower triple clamps. • Anti-lock braking system (ABS). • Lightweight, cast-aluminum 10-spoke wheels. • Conventional, tapered aluminum handlebar. • 14-litre steel fuel tank. • Revised one piece, long design rider & passenger seat. • Compact, liquid crystal multi-function meter / instrument. • New, 4 – LED tail light with unique running / brake light display. NOTE: The FZ-09 offers a significant level of power and performance. It is not intended for novice or inexperienced riders.